Political donations: A corrupting influence? Recent revelations and media scrutiny in relation to political donations at both the Commonwealth and state and territory levels have brought the effectiveness of Australia's federal political funding and disclosure scheme squarely back into focus.1 There is a growing concern about political donations made by vested interests and their influence on public policy. In a properly functioning democracy, citizens can expect their elected representatives to be transparent and accountable in carrying out their public duties. Moreover, citizens can expect elected officials to act in the public interest, and to not partake in corrupt behaviours. Of specific interest to this inquiry is the risk that political funding; in particular, large donations from private interests, poses in terms of 'corruption through undue influence'. Such corruption constitutes a type of conflict of interest. The payment of political donations with the intention of 'buying access' to elected representatives and the risk this poses in terms of corruption through undue influence is discussed throughout the remainder of this chapter. Many participants of the inquiry expressed strong concerns that the existing political funding and disclosure scheme does not effectively achieve the aim of preventing corruption and consequently, undermines the democratic process. A more detailed discussion of the extensive problems afflicting the current federal political funding and disclosure regime and proposed measures for reform is set out in Chapter 5 and Chapter 6. It is difficult to objectively establish the intent behind political donations and whether they have had any influence on government policy outcomes. However, strong indications of undue influence are provided by patterns between political donations over time and their proximity to key policy decisions. Submitters and witnesses pointed to trends in political donations from the gambling, alcohol, and mining industries as displaying patterns of possible undue influence. These are outlined below. 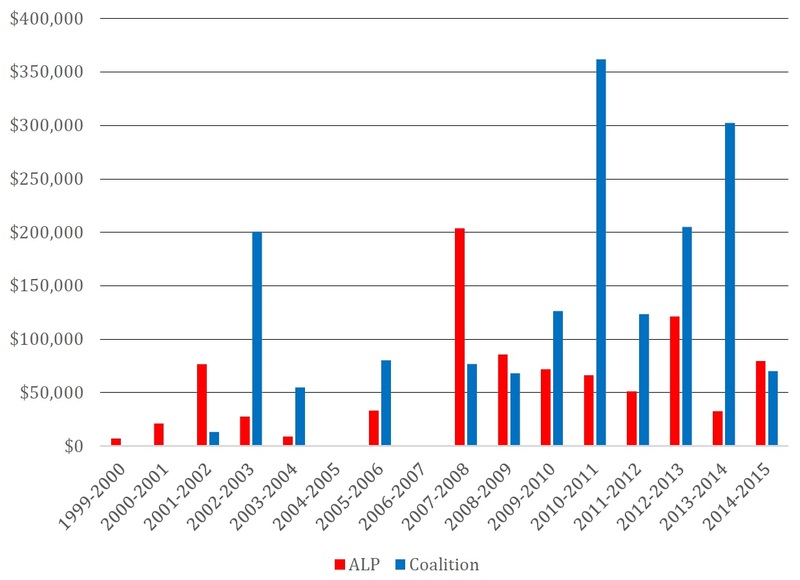 Figure 3.1 shows the amounts donated to the ALP and Coalition parties during the period examined. As explained by FARE, the WET favours larger wine producers, 'who benefit from greater economies of scale and are therefore able to produce cheaper bulk wine'. In 2004, the WET rebate was introduced with the intention of alleviating the impost of the WET on small rural wineries in Australia.23 The WET rebate entitles wine producers to a rebate on the WET they have paid up to a maximum amount each financial year. A series of donations (totalling more than $675,000 in 2015–16 terms) from Southcorp to the Liberal–National Coalition in the lead-up to and immediately following the introduction of the WET in 2000. Significant donations (totalling more than $220,000 in 2015–16 terms) made by Southcorp in the 12-month period leading up to introduction of the WET. A marked increase in donations by the South Australian branch of the AHA in 2001–2002, predominately to the Howard Government, prior to the introduction of the WET rebate. A substantial increase in donations from the AHA in the two years to 2012–13, following the 2010 recommendations of the Henry Tax Review that all alcohol tax be moved to a volumetric system. In September 2017, the Australia Institute published a report—The tip of the iceberg: Political donations from the mining industry—looking at patterns of political donations declared by the mining industry during the 10 years to 2016. 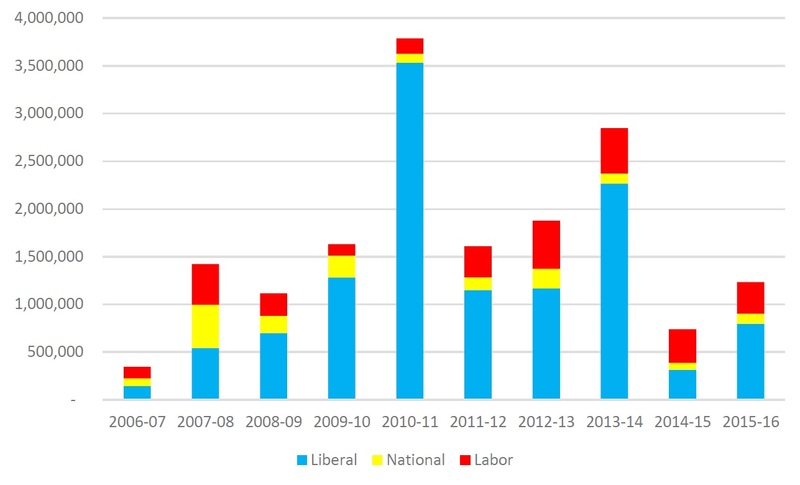 Figure 3.2 illustrates the disclosed donations to the major parties from the resource sector during the period examined. Under its terms of reference, the committee sought to examine the motivations and reasons behind why entities give donations to political parties and candidates. In addition to evidence received through submissions and public hearings, the committee wrote to a number of organisations to inquire as to the nature of their political donations, as well as their motivations for, or for not, making political donations and what outcomes they have achieved, or expect from those activities. The committee is grateful to those organisations that willingly engaged with the inquiry and contributed frankly and transparently to discussions. However, the committee also notes that there were a number who declined the committee's invitations to participate in the inquiry. Responses to the committee's request for information highlighted the various forms that political donations can take as well as the different approaches organisations take to reporting their political expenditure. The committee also heard evidence from Woodside Energy Ltd (Woodside) regarding their subscriptions to the major parties' business forums. Woodside told the committee that they subscribe to 'platinum level' memberships to both major party business forums at an annual cost of $110,000 per subscription. Woodside includes these forum subscription fees in its annual disclosure returns to the AEC. CHAIR: The rate that you're charged, the $110,000, is that a standard fee for anybody who wants to get annual access to one of these forums, or is it just charged depending on who's applying? Are there differential rates? Woodside also provided the committee with information as to the number and type of events included in their membership subscriptions. Policy Briefing Sessions—Two (2) Policy Briefing sessions, designed to address achievements, issues and challenges in key portfolio areas. Leader Events—tickets to Leader events in Perth. Federal Budget Reply Dinner 2017—Four (4) tickets on an opt-in basis. Federal Labor Business Exchange Program 2017—Two (2) tickets to the Federal Labor Business Exchange program, a two-day conference with Shadow Federal Ministers, to be held in Sydney in 2017. The program provides delegates with a unique opportunity to receive briefings on major policy areas, and to network with Federal Shadow Ministers. End of Year Drinks with the Leader of the Opposition—Five (5) tickets on an opt-in basis. In response to the committee's request for information, a number of donors cited support of the democratic process as a main motivation behind their donations to political parties. Some donors pointed to a need to engage in and contribute to policy discussions as a motivation for making political donations. In addition to those motivations noted above, building and maintaining relationships with key political stakeholders was raised as a reason behind donors' political contributions. Donors noted that attendance at business forums and other political party and candidate events and fundraisers provides them with opportunities to engage with members of Parliament on matters relevant to their industry. The committee questioned donors as to whether their political donations, including paid subscriptions to the major parties' business forums, constitute a form of 'buying access' to elected representatives, and moreover, whether there was any expected benefit from such contributions. Donors sought to assure the committee that there is no expectation of preferential access or direct benefit. CHAIR: You wouldn't say there's preferential access? Not many people can afford to spend that much money to attend forums with their political representatives. A number of participants were sceptical of donors' claims regarding the motivations behind their political donations, suggesting that the access to elected representatives that is obtained through donations cannot be separated from the risk of undue influence. Some submitters and witnesses argued that donors cannot claim to make political donations in support of the democratic process when they donate to both major parties.75 Participants also highlighted that doing so with no expectation of benefit would be counter to a company's legal obligations to act in the best interests of its shareholders. Logic suggests that, when one business is making donations to respective sides of politics simultaneously, it is not about supporting a political ideological position. Some don't even pretend but simply make equal donations to both. When those donations are worth hundreds of thousands of dollars or even millions of dollars, questions about the responsibilities to shareholders arise. The committee heard evidence to suggest that political donations, and the privileged access they buy, can risk leading to undue influence whether or not the recipient is mindful of this effect. A situation in which citizens believe elections can be bought or that there is some quid pro qua for helping a candidate win must be seen as seriously damaging to the proper functioning of a democratic government. A corrupt member of parliament can be voted out of office if elections are free and fair. But if there is a loss of trust in the election process, then the whole system of representative government is weakened. Mr Thorburn: …The reason why we felt that a change was needed comes back to the point around wanting to be respected as a bank and as a company, and for us to make sure that our community and our customers do not see conflict. I think the things we are doing around remuneration are other examples of that but, in essence, we felt that the donations we were making to political parties was being misconstrued, misinterpreted, incorrectly. The committee accepts and supports that all stakeholders have a right to have a legitimate say in the democratic process. However, there is significant public concern around the motivations of some donors, and that the influence they have on the decision-making of governments is disproportionate to the influence other citizens enjoy. The committee heard compelling evidence that the current political funding and disclosure regime fails to provide the necessary safeguards to prevent corruption of the political process. The fact that the source of the significant majority of funding to those involved in the political process is undisclosed and unknown, is inimical to maintaining trust in the process. There are obvious loopholes in the current regime around how some fundraising activities are defined. Political parties and their associated entities do not have to disclose all fundraising activities, including recent innovations such as membership of business forums, as donations. This allows for substantial sums to be raised, in circumstances that by their very nature, allow privileged access to those who subscribe to them. In the committee's view, there is no discernible reason why any category of fundraising activities should be excluded from the obligations to disclose them. In August 2016, the NSW Independent Commission Against Corruption published its report on its investigation into NSW Liberal Party electoral funding for the 2011 state election campaign (known as Operation Spicer). The investigation uncovered extensive evidence of corrupt conduct; including, the making of donations by 'prohibited donors' under NSW law, disguising the identity of donors by channelling donations through third parties, disguising donations as payments for services, and breaches of relevant funding and expenditure caps and disclosure requirements. Associate Professor Joo-Cheong Tham, Submission 3 – Attachment 2, p. 13. Associate Professor Joo-Cheong Tham, Submission 3 – Attachment 2, p. 15. Professor George Williams AO, Submission 1, p. 1. See also Associate Professor Joo-Cheong Tham, Submission 3 – Attachment 2, p. 15. See Dr Belinda Edwards, Dark Money: The hidden millions in Australia's political finance system, 2016. 2 November 1983, p. 2213. Synod of Victoria and Tasmania, Uniting Church in Australia, Submission 20, p. 2. Dr Charles Livingstone and Ms Maggie Johnson, Submission 18, p. 2. See Dr Charles Livingstone and Ms Maggie Johnson, Submission 18—Attachment 1. Dr Charles Livingstone and Ms Maggie Johnson, Submission 18—Attachment 1, [p. 2]. Dr Charles Livingstone and Ms Maggie Johnson, Submission 18—Attachment 1, [p. 3]. Dr Charles Livingstone and Ms Maggie Johnson, Submission 18—Attachment 1, [p. 7]. See Foundation for Alcohol Research and Education, Submission 25, pp. 6–8. The WET applies to the following beverages where they contain more than 1.15 percent by volume of alcohol: grape wine, grape wine products, fruit and vegetable wines, cider and perry, mead, and sake. Foundation for Alcohol Research and Education, Submission 25, p. 6. Foundation for Alcohol Research and Education, Submission 25, p. 7. Foundation for Alcohol Research and Education, Submission 25, pp. 7–8. The Australia Institute, The tip of the iceberg: Political donations from the mining industry, September 2017, p. 9 (tabled 2 November 2017). The Australia Institute, The tip of the iceberg: Political donations from the mining industry, September 2017, p. 4 (tabled 2 November 2017). The Australia Institute, The tip of the iceberg: Political donations from the mining industry, September 2017, pp. 9–10 (tabled 2 November 2017). 30 January 2018, p. 28. Australian Electoral Commission, Donor Annual Return 2016–17: Minerals Council of Australia, [p. 7]. ANZ, Additional Information 13, received 27 November 2017, p. 1. Australian Electoral Commission, Donor Annual Return 2016 – 17: ANZ Banking Group Limited, p. 3. Financial Services Council, Additional Information 17, received 30 December 2017, p. 1. Australian Electoral Commission, Donor Annual Return 2016–17: Financial Services Council Limited, [p. 4]. The Financial Services Council donated a total of $43,101. 40 to the Liberal Party and $46,469.35 to the ALP in 2016–17. Deloitte, Additional Information 19, received 20 November 2017, p. 1. Under the Electoral Act, the current definition of what constitutes a 'gift' places no obligation on donors to lodge a return for payments such as membership subscriptions or attendance at fundraising events. Macquarie Group, Additional Information 4, received 21 November 2017, p. 1. See also Mr Anthony Michael Rutherford Abbott, Senior Vice President, Corporate and Legal, Woodside Energy Ltd, Committee Hansard, 2 November 2017, pp. 38–39. Nine Entertainment Co, Additional Information 8, received 23 November 2017, p. 1. 30 January 2018, pp. 37–38. Minerals Council of Australia, Additional Information 6, received 22 November 2017, p. 1. 30 January 2018, p. 30. 30 January 2018, p. 38. 2 November 2017, p. 43. See Australian Electoral Commission, Submission 2—Attachment 1, p. 8. See, for example, Mr Anthony Michael Rutherford Abbott, Senior Vice President, Corporate and Legal, Woodside Energy Ltd, Committee Hansard, 2 November 2017, pp. 38–39; Macquarie Group, Additional Information 4, received 21 November 2017, pp. 1–2. 30 January 2018, p. 36. Mr Mark Davis, Director, Strategy and Communications, Minerals Council of Australia, Committee Hansard, 30 January 2018, pp. 32–33. PricewaterhouseCoopers, Additional Information 15, received 4 December 2017, p. 1. Crown Resorts Limited, Additional Information 7, received 23 November 2017, p. 1. Insurance Council of Australia, Additional Information 9, received 23 November 2017, p. 2. Macquarie Group, Additional Information 4, received 21 November 2017, p. 2. Woodside Energy Ltd, Submission 16, p. 1. Mr Anthony Michael Rutherford Abbott, Senior Vice President, Corporate and Legal, Woodside Energy Ltd, Committee Hansard, 2 November 2017, p. 38. 30 January 2018, p. 40. Synod of Victoria and Tasmania, Uniting Church in Australia, Submission 20, p. 3. Committee Hansard, 6 November 2017, p. 21. See, for example, Public Health Association of Australia, Submission 32, p. 5; Dr Charles Livingstone and Ms Maggie Johnson, Submission 18, p. 6; Associate Professor Joo-Cheong Tham, Submission 3—Attachment 2, p. 37; Foundation for Alcohol Research and Education, Submission 25, p. 9. Dr Belinda Edwards, Committee Hansard, 6 November 2017, p. 1. 6 November 2017, p. 13. See also Dr Ingrid Johnston, Senior Policy Officer, Public Health Association of Australia, Committee Hansard, 6 November 2017, p. 16. Public Health Association of Australia, Submission 32, p. 4. Foundation for Alcohol Research and Education, Submission 25, p. 9. See Associate Professor Joo-Cheong Tham, Submission 3 – Attachment 2, p. 19. Associate Professor Joo-Cheong Tham, Submission 3 – Attachment 2, p. 19. See, for example, Public Health Association of Australia, Submission 32, p. 4. Mr Jon Shirley, Submission 19, p. 1. Anglican Church Southern Queensland, Submission 23, p. 1. Transparency International Australia, Submission 33, p. 2. National Australia Bank, Additional Information 16, received 11 December 2017, p. 1. Mr Andrew Thorburn, Chief Executive Officer, National Australia Bank, Committee Hansard, House of Representatives Standing Committee on Economics, 6 October 2016, p. 27.